A practice development programme for community groups working to promote and enhance dignity in responses to food insecurity. Communities cannot be held responsible for, or bear the disproportionate burden of, food insecurity in Scotland, but, with appropriate support, the community food sector is well placed to respond to current crises and promote and restore dignity at a local level. We believe that ending household food insecurity and becoming a Good Food Nation requires all of us to work together. We will need both national action to secure decent incomes and the strategic and coordinated development of community food infrastructure to deliver on health and social inclusion. The Dignity in Practice project works alongside community food groups and organisations to explore the detail of what promoting and enhancing dignity looks like in community food provision. The peer support programme encourages practice change that recognises the important role of community initiatives as sources of support to people experiencing food insecurity, as well as inclusive spaces for people to access, share and enjoy food, regardless of their circumstances. If you would like to be involved or be kept in the loop, fill in the contact form here. This project is delivered in partnership with the Poverty Truth Commission and funded by the Scottish Government’s Fair Food Transformation Fund. 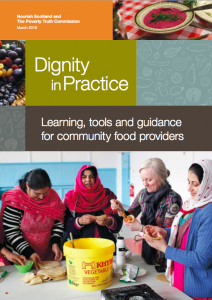 Download Dignity in Practice: Learning, tools and guidance for community food providers (2018, full report) and Tools for community food providers (2018) by clicking the images to the right. For a short plain text version, see our summary of project learning with case studies. Involve in decision-making people with direct experience. Recognise the social value of food. Leave people with the power to choose. The Scottish Government’s acceptance of the recommendations in the report, and commitment to place ‘dignity’ at the centre of the design and delivery of responses to food insecurity (instead of, for example, ‘feeding people in need’) created a welcome opportunity for all those involved in the response to reflect on supporting people beyond charitable, emergency provision. The Dignity Project aimed to explore and understand better the practical ways that community organisations and practitioners could bring the Dignity Principles into practice. Between November 2016 and October 2017, Nourish Scotland and the Poverty Truth Commission worked closely with people with lived experience of food insecurity, staff and volunteers involved in community food initiatives and wider stakeholders to explore what dignity means in practice. 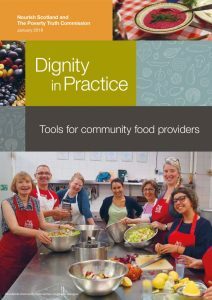 The ‘Dignity Principles in Practice’ were developed to provide a way for community food providers to reflect on the design and delivery of their work and engage with the Dignity Principles from the perspective of someone experiencing food insecurity. Having power to make choices about what, where, when, how and with whom you eat. Feeling able and welcome to take part in different aspects of community life, regardless of your financial situation. Being able to enjoy food and access support that meets your needs. Feeling able to share your views and ideas and to have those views taken seriously in decision-making. Feeling recognised and valued as a whole person with knowledge, skills and experiences to share. If you would like to be involved or have any questions please contact Chelsea or email dignity @ nourishscotland.org. This project is part of our wider work on a right-based approach to food. See also our Right to Food campaign and our Menu for Change project.